Two letters written by First Lieutenant and Adjutant Fifth Infantry George W. Baird in Fort Leavenworth to the Kansas Adjutant General in Topeka. In one letter, he expresses the "great distrust of claim agents" felt by the heirs of deceased soldiers. 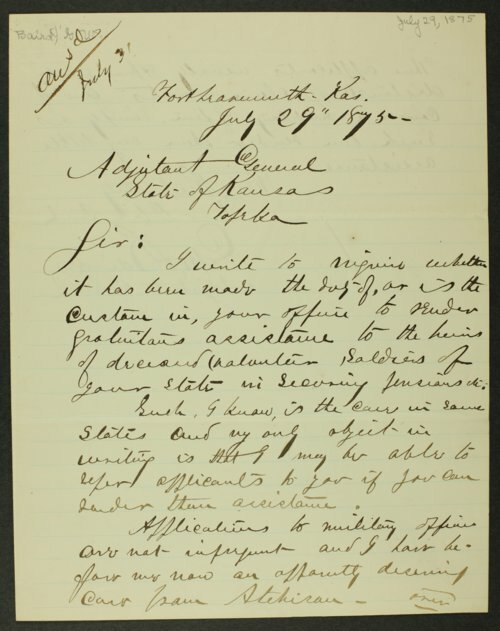 In the other letter, he writes that he is now enlisting men, in his position as recruiting officer, for the regular cavalry regiments engaged in the Sioux Wars.